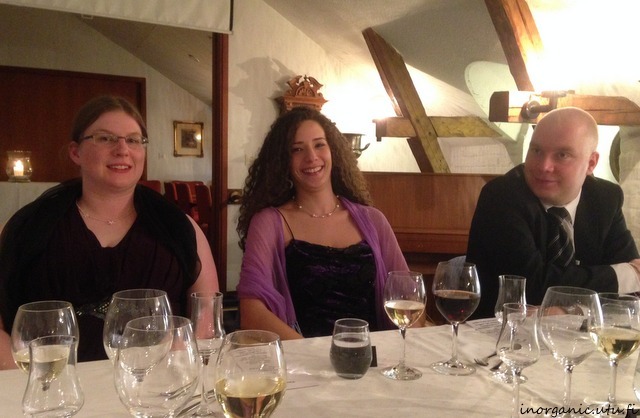 Emilia defends her doctoral thesis on 12.4. MSc Emilia Palo defends her doctoral thesis “Modifying upconverting nanoparticles with polyelectrolyte multilayers” on Friday 12.4.2019 at 12 o’clock noon in Pub3 lecture hall, Publicum. Adj. Prof. Mika Lastusaari (University of Turku) will act as the Custos and Prof. Darja Lisjak (Jožef Stefan Institute) will act as the Opponent. Newest publication from the metal-organic part of our group can be found below. In addition to the publications, for this spring we have two incoming dissertations. Emilia has her dissertation in April and Isabella in May, so don’t miss out! Salonen, P., Peuronen, A., Sinkkonen, J., and Lehtonen, A. “Oxidovanadium(v) complexes with L-proline-based amino acid phenolates” Inorg. Chim. Acta 489 (2019) 108-114. Adj. 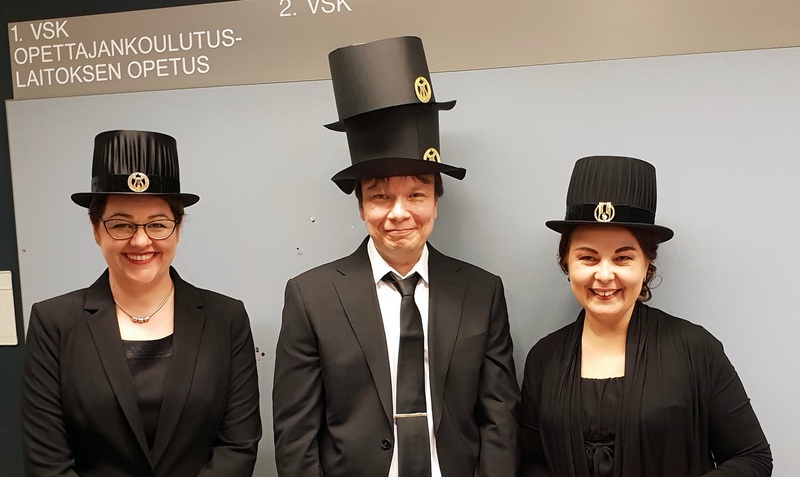 Prof. Mika Lastusaari succesfully defended his 2nd thesis in the Department of the Education on Saturday 10th of November 2018. 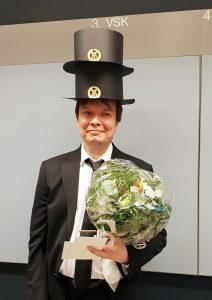 Congratulations to our double Dr, we are proud of you! Mika defends his 2nd thesis on Saturday! Dr. Mika Lastusaari defends his thesis from the Faculty of Education, Department of Teacher Education on Saturday 10th of November at 12 o´clock noon in the lecture hall Educarium 1. His thesis is titled “Persistence in major in relation to learning approaches – Development of a questionnaire for university chemistry students”. Amazing job and well done, Mika! We are thrilled that we’re going to have a two-times Dr. (or maybe Dr.Dr.) in our research group soon! “Uusi työkalu auttaa tunnistamaan opiskelijat joiden opinnot ovat vaarassa keskeytyä” Bulletin at UTU (www) in Finnish. MSc Hellen Santos will have her doctoral dissertation on Friday 15th of December at at 12 o’clock in the lecture hall Arcanum 1. The title of the thesis is “Halogen hectorites: Smectites designed to luminesce” and concerns design and preparation of these synthetic clay minerals and the studies how they could be used as optical materials. Tero successfully defended his thesis yesterday, congratulations for reaching this huge milestone! We had a pleasure to host his opponent Dr hab. Dariusz Hreniak for one day and celebrate together this achievement in good company and with great food. Thank you Tero for the great party and good luck for your career in the future – we’re sure it will be bright! 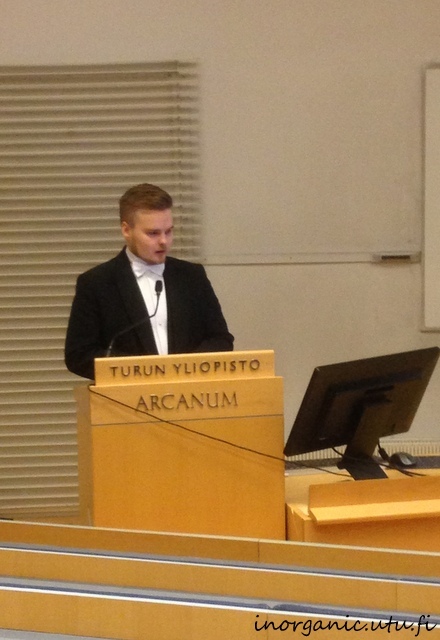 Tero will defend his thesis on 14.12. 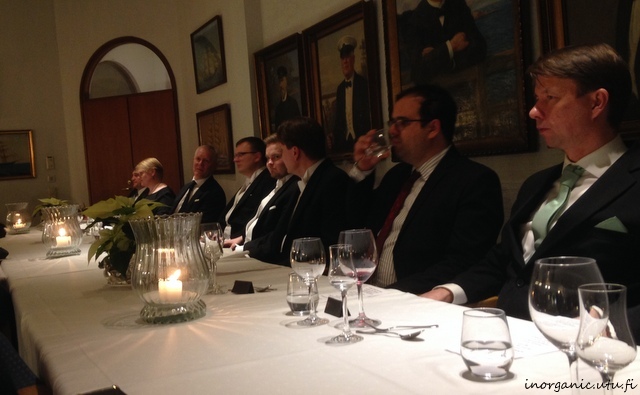 MSc Tero Laihinen will have his doctoral thesis defence on Wednesday 14th of December at 12 o’clock in the lecture hall Arcanum 1. The title of the thesis is “Lanthanide doped NaYF4 up-conversion luminescence materials” and focuses on improving the co-precipitation synthesis procedure and modification of the up-conversion luminescence color of the materials. Mr. Laihinen has been working in our group during his doctoral studies and is supervised by Adj. 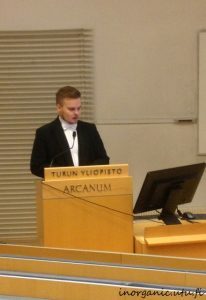 Prof. Mika Lastusaari. During his work he has improved the manufacturing process and proved that it is possible to obtain efficient up-conversion luminescence from multiple lanthanide doped materials. MSc Vishal Kale will defend his doctoral thesis on Friday 13th of November at 12.00 in Pharmacity Auditorium. The thesis topic is “Blue and Uv-Emitting Upconversion Nanoparticles: Synthesis and (Bio) Analytical Applications”. In the thesis the luminescent properties of the nanocrystalline NaYF4:Yb3+,Tm3+ particles are improved and their use as labels and internal light sources in biomedical applications is introduced. 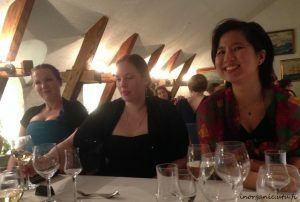 Mr. Kale has been working in the Department of biotechnology but is jointly supervised by Mika Lastusaari. The work of Mr. Kale is a great example how you can combine the chemistry behind the synthesis developement and the use of nanoparticles in applications in multidisciplinary areas.